It is an unfortunate fact that America has a significant problem with the pervasive use of opiate drugs and alcohol. While this has been an ongoing issue, more recently, addiction rates have increased and this is placing considerable pressure on the national health care system. A large proportion of opiate addiction pertains to legal prescription medications. According to the National Institute for Drug Abuse, there are over one million people in the United States dependant on legal opiates, with a further six million using the psychotherapeutic drugs with the potential to also become addicted. Alcohol abuse continues to plague the United States with approximately 14 million Americans, meeting the diagnostic measure for alcohol abuse or alcoholism. This equates to 7.4 percent of the American population! Although these figures are depressing, there are excellent opportunities to beat these addictions under the correct guidance. While there are many different treatment options for opiate and alcohol dependency, the use of naltrexone has proven to be very effective. 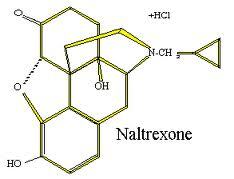 Naltrexone works by blocking the effects of opioids in the brain. It binds to opioid receptors, stopping opioids from stimulating the neurons and creating the experience of pleasure or euphoria from opioid drug and alcohol use. Naltrexone is a popular choice because it doesn't interfere with any other functions within the body and therefore it has minimal side effects. Naltrexone therapy helps patients regain a sense of happiness without the desire for opiates. While the opiate receptors are blocked, patients have fewer cravings and if they do continue to consume alcohol or other opiates they do not receive the same stimuli which lead to the addiction in the first instance. Most commonly naltrexone is taken orally, although some clinics such as The Coleman Institute offer naltrexone implants. The implants are placed under the skin and are designed to slowly release naltrexone over six to twelve weeks. This is a highly effective treatment method because patients aren't required to remember to take their naltrexone medication. Also, the steady dose over several weeks creates greater stability and increases the probability that the patient will remain abstinent in the future. The benefits of naltrexone implants have been recently verified during a clinical study. A new publication in the American Journal of Psychiatry, titled 'Naltrexone Implant for the Treatment of Polydrug Dependence: A Randomized Controlled Trial', details research into the effectiveness of naltrexone implants. The research team concluded that after a ten week study period, patients that received the naltrexone implants had a greater success rate than those who received a placebo implant. Given these favorable results, this drug treatment program is likely to continue to expand and offer a new and more effective method of beating drug and alcohol dependency. If you or someone you love needs help getting off of opiates such as Oxycontin or Percocet or alcohol, please don't hesitate to contact us at 1.877.77.DETOX (33869). Help, Hope, and Healing begins here!